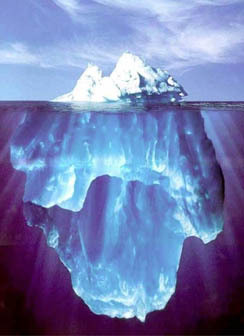 The fact that water expands upon freezing causes icebergs to float. The fact that water reaches a maximum density at about 4°C causes bodies of water to freeze on the top first. Then the further expansion as a part of the phase change keeps the ice floating with some 8% of its mass above the surface. The expansion during the phase change may be shown on a PvT surface, and contrasts with the contraction upon freezing of most substances. While the hexagonal ice form discussed above is the primary form of ice and is the dominant form from the freezing point at 273K down to about 72 K, 13 different crystalline forms of ice have been idendified according to Debenedetti and Stanley. Water at ordinary temperatures contracts and increases in density as it is cooled, like most substances. But at about 4°C it reaches a maximum density and then decreases in density as it approaches the freezing point. This decrease in density is only about one part in 10,000 as it cools from 4°C to 0°C, but this is sufficient to cause the water near freezing to come to the top. The water further expands upon freezing, so that water freezes from the top down, and ice floats on water. Water has the highest specific heat of any common substance, 1 calorie/gm °C = 4.186 J/gm °C. This provides stability of temperature for land masses surrounded by water, provides stability for the temperature of the human body, makes it an effective cooling agent, and many other benefits. The high heat of vaporization of water makes it an effective coolant for the human body via evaporation of perspiration, extending the range of temperatures in which humans can exist.